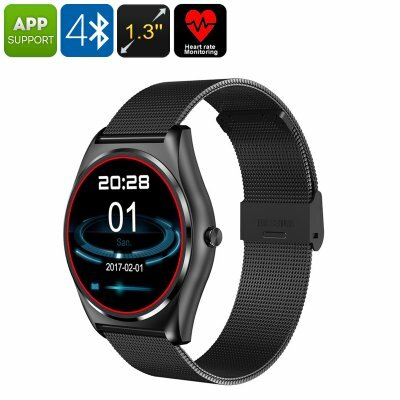 Successfully Added Bluetooth Sports Watch Ordro B7 - Heart Rate Monitor, Pedometer, Sleep Monitor, Calorie Counter, Call Reminder, iOS + Android to your Shopping Cart. The Ordro B7 sports watch functions as your own personal fitness guide. It comes packed with an abundance of smart health and fitness features. These provide you with valuable data on your current health and stamina levels. On its bright 1.3-Inch display, you’ll be able to clearly read your body’s status during exercise. Thanks to this, you’ll always be able to take the most out of your upcoming workouts. The smart watch is compatible with both iOS and Android smartphones. It supports fast and lag-free data transactions thanks to Bluetooth 4.0. With an accurate heart rate monitor in place, you’ll always be up to date on your current heart rate levels. This provides you with valuable information on how to optimize your upcoming training sessions. The sports watch furthermore comes with a pedometer. This feature keeps track of the number of steps you take and distance you cover throughout the day. Additionally, a sleep tracker is in place. Thanks to this, you can always be guaranteed that you get the needed rest to recover fast. With its calorie counter, this sports watch keeps great track of your exercise levels throughout the day. From now on you can always be guaranteed that you get the needed exercise to meet your fitness goals. The sports watch packs a sophisticated 210mAh rechargeable battery. This treats you with enough power to get through numerous days of usage time. The sports watch additionally supports music playing and call/message reminders. From now on, you’ll never miss an important call or message again. Thanks to its daily life water-resistant design, this smartwatch can be used in any weather condition. Whether you’re into running, cycling, or skiing – this sports watch is the perfect health accessory. This Bluetooth watch comes with a 12 months warranty, brought to you by the leader in electronic devices as well as wholesale electronic gadgets..